How Long Should Your Email Subject Line Be? Spoiler alert: It doesn’t matter. Here’s why. 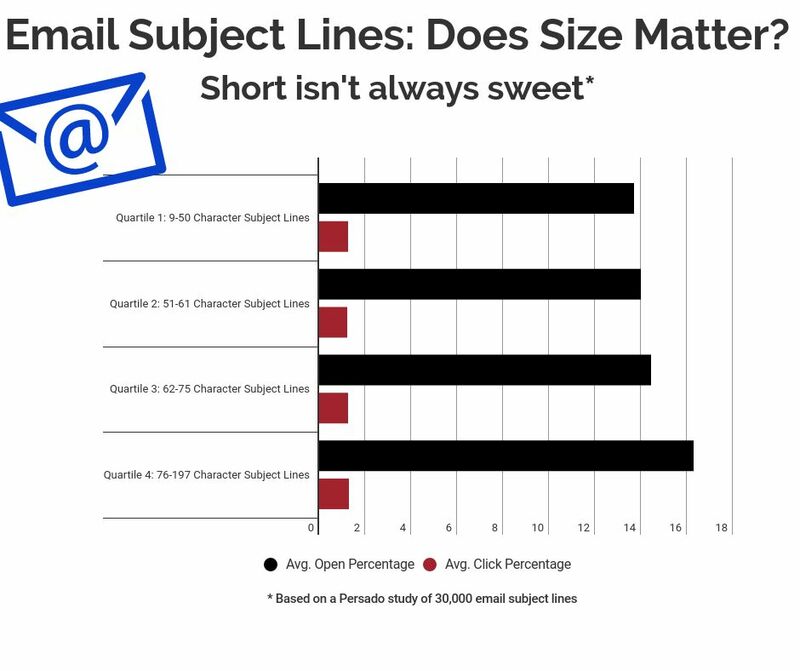 This debunks the marketing best practices myth that email subject lines must be short and sweet and is in line with a 2016 Persado study of 20,000 emails that produced similar results. A genealogy company launched an email campaign in the UK market. On the low end of the spectrum, a 56-character email subject line yielded 1,590 actions (defined as opens/clicks), while an 120-character one led to 1,770 actions. Similarly, a travel company targeted US customers with an email campaign. An email subject line with a character length of 35 resulted in 52,453 actions. The email subject line performance didn’t see a significant dip when the company more than doubled its characters. A 77-character email subject line in the same campaign had 52,358 actions. OK. What does work then? Emotional language, formatting and personalization, according to countless Persado control studies of the ingredients for great email subject line performance. Marketers achieve engagement and long-term consumer relationships by customizing messages for their audience. And email subject line performance will vary from industry to industry and from country to country. There’s a good chance that what works for a UK genealogy company may not work for a travel company across the pond. Email AI marketing tools like Persado will quickly figure out what’s best for a brand and quickly optimize it.